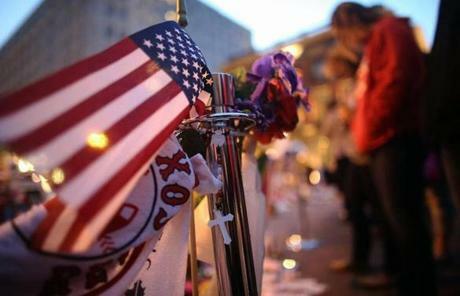 People gathered at a makeshift memorial for victims near the site of the Boston Marathon bombings at the edge of the still-closed section of Boylston Street. 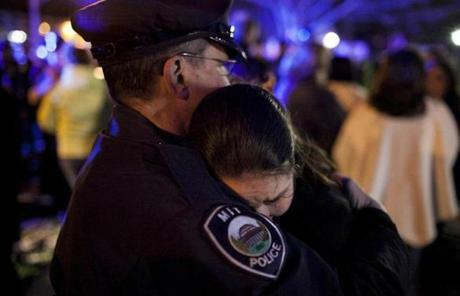 A woman hugged an MIT police officer after a vigil in Wilmington for slain officer Sean Collier. 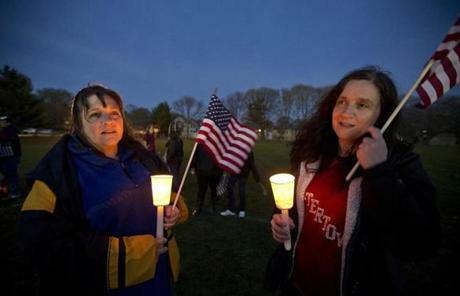 Julie Maloney (left) and her sister, Cynthia Maloney, attended a vigil in Watertown. 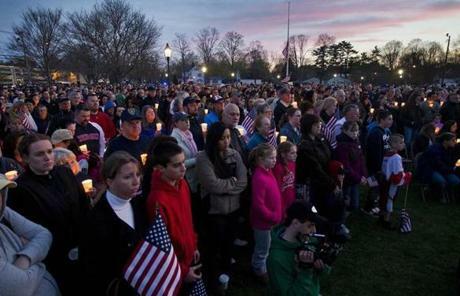 People held candles for Collier at the Town Common in Wilmington. 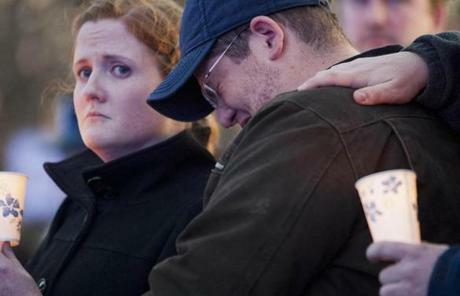 Andrew Collier grieved during the vigil for his brother, the MIT police officer killed Thursday. 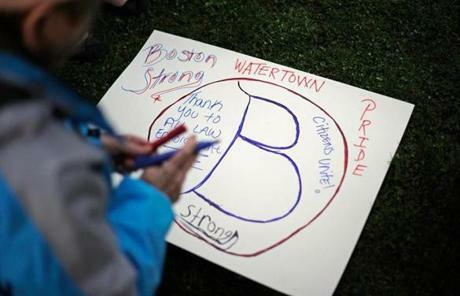 A woman made a sign during a candlelight vigil for victims of the Boston Marathon bombing at Watertown's Victory Park. 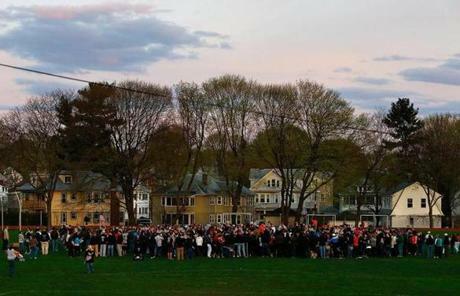 Watertown residents gathered for a vigil a day after a manhunt in the area ended with the apprehension of 19-year-old bombing suspect Dzhokhar A. Tsarnaev. 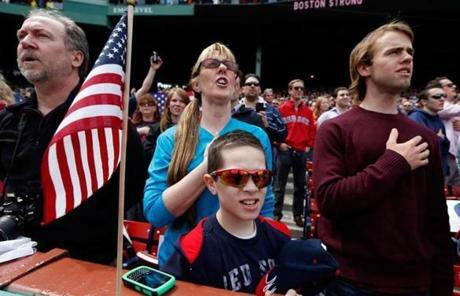 A Red Sox fan held a flag during the broadcast of a memorial program. 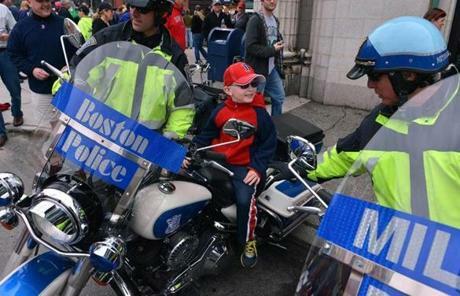 Boston police officer Tim Hicks gave 6-year-old Shane Evans a turn on the seat of his motorcycle outside Fenway Park. 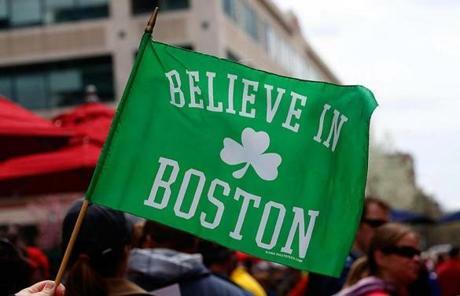 Bob Goodman of Watertown, who was at the finish line at the Boston Marathon and lived in the neighborhood where bombing suspect Dzhokhar Tsarnaev was captured, reacted during opening ceremonies. Law enforcement officers stood at attention during pregame ceremonies. 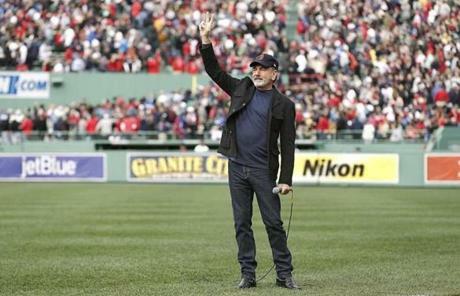 Neil Diamond sang "Sweet Caroline" during the middle of the eighth inning. 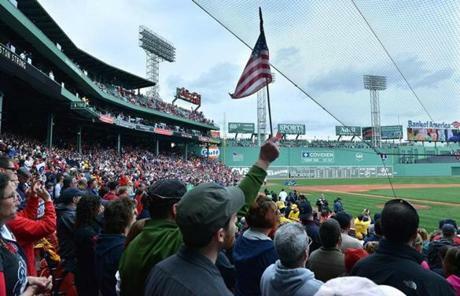 Attendees at today’s game at Fenway Park. 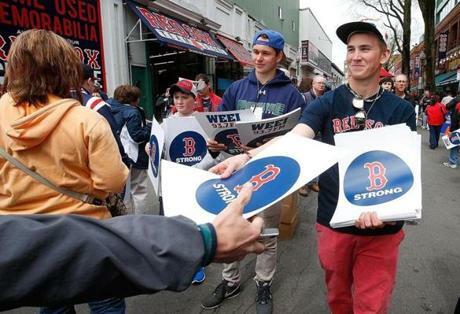 Fans held a flag outside Fenway Park before today’s game. 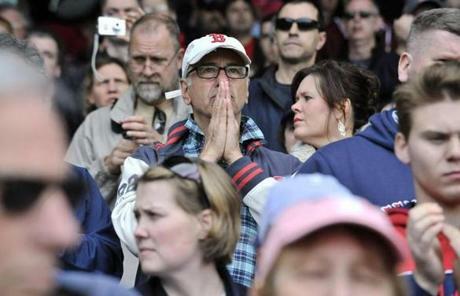 The scene outside Fenway Park. 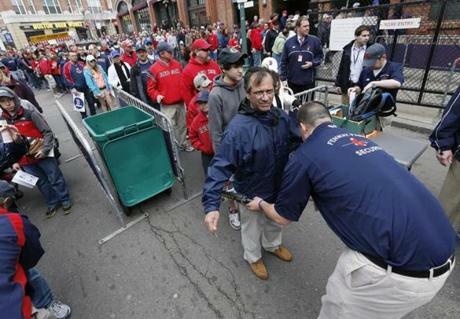 Fans passed through security as they entered the park. 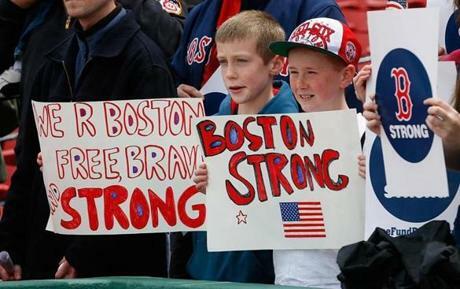 Fans sang the national anthem. 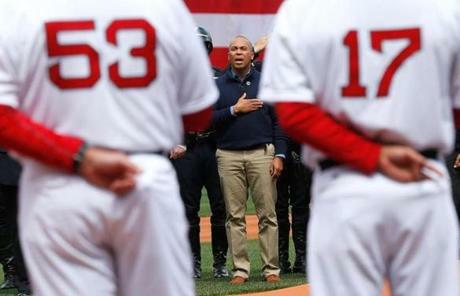 Governor Deval Patrick was on the field with other officials and guests. 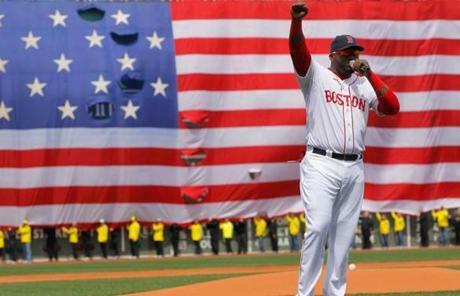 David Ortiz spoke before the game at Fenway. 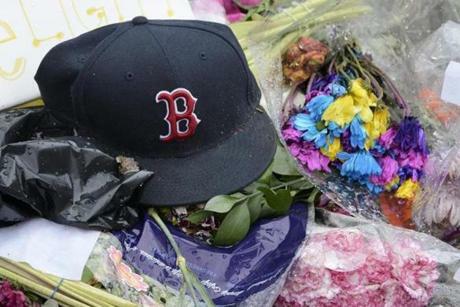 A Red Sox hat and flowers were at a memorial near Fenway. 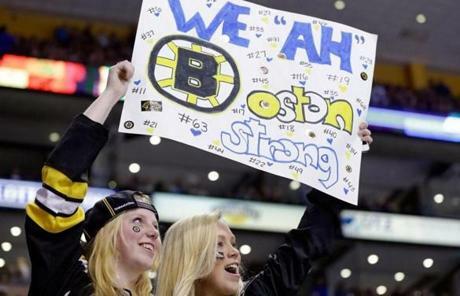 Fans held signs at TD Garden during the game against the Penguins. 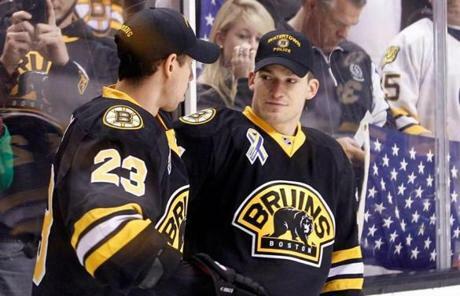 Andrew Ference, right, talked with Chris Kelly. 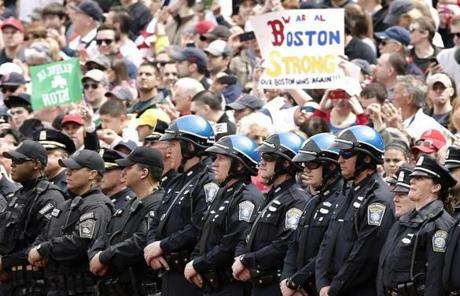 The Bruins wore hats from local law enforcement agencies before the game. 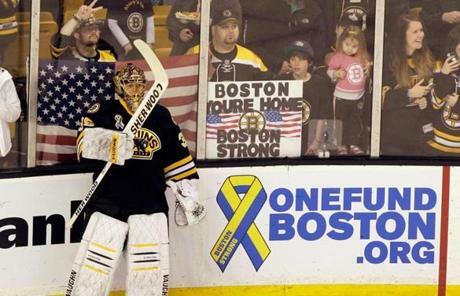 Bruins goalie Anton Khudobin paused during warm-ups.